New Year's Eve is fast approaching! Check out all the NYE deals around Chicago and make sure to ring in 2018 right! Honey Butter Fried Chicken- Those staying in this New Year’s Eve to avoid Uber surges and expensive parties can still enjoy decadent eats at home thanks to Honey Butter Fried Chicken. The Avondale restaurant is back with their New Year’s Eve “Fancy Packs,” an elevated menu of their fried chicken and comfort food favorites available for pick up or delivery. The $95 menu feeds four and includes their famous fried chicken, topped with truffle-infused honey butter, as well as a duck fat mashed potato with saffron country gravy, snickerdoodle sandwich cookies, and more. The New Year’s Eve Fancy Packs are available from 6-9 p.m. on December 31 via in-house pickup or for delivery. Guest can order online through Honey Butter’s Caviar website. Izakaya at Momotaro- Countdown to 2018 at the Izakaya’s New Year’s Eve Celebration. Guests are invited to party at the Izakaya, located on the subterranean level of Momotaro, from 9pm-1am. Tickets include a premium bar package featuring a selection of beer, wine, sparkling and speciality cocktails; passed hor d’oeuvres; and a champagne toast at midnight. A tarot card reader will be onsite to tell guests what lies in store for them starting in 2018. Guests can wear their best dancing attire and not worry about the December/January chills as there will be a complimentary coat check. The Izakaya will also provide guests a variety of goodies including noisemakers, hats and beads to fully accessorize and celebrate the coming of 2018. Swift & Sons- Swift & Sons will serve their normal indulgent menu with a few celebratory twists. Add-ons will be available throughout the evening on New Year’s Eve, with caviar and champagne carts circling the room, specialty cocktails and over the top sides. Devereaux- 70’s chic Devereaux, nestled atop the Viceroy Chicago hotel, will get tiki with an NYE Splash from 9:00pm-1:00am. Cocktail master Lee Zaremba will serve a stellar menu of tiki cocktails with a midwestern twist, and executive chef Lee Wolen will cook a whole roasted pig with pineapple, along with other tiki-themed small bites. A champagne toast at midnight will also be served. Beach decor will be abundant at this Frankie and Annette style beach bash and a resident DJ will spin cool tunes & tropical vibes. Maple & Ash- Chicago’s steakhouse is offering two ways to ring in 2018. On Sunday, December 31, start the celebrations early with Maple & Ash’s Countdown to the Countdown brunch featuring classic Maple & Ash brunch fare, countdowns every hour, and fun NYE accessories to enjoy with friends and family. Brunch is priced at $55 per person, with the option to add unlimited bubbles for an additional $25. For New Year’s Eve Dinner, Maple & Ash offers its dinner menu a la carte including favorites such as the Fire Roasted Seafood Tower, dry-aged steaks, and Ricotta Agnolotti as well as holiday specials and a Champagne toast at midnight. Maple & Ash’s Countdown to the Countdown brunch is from 10 a.m.-1:30 p.m. and New Year’s Eve dinner will begin at 4:30 p.m. Space is limited and reservations with a credit card guarantee are required. Reservations can be made by calling OpenTable. Maple & Ash is closed on New Year’s Day, January 1. Signature Room- Celebrate New Year’s Eve at the restaurant and lounge atop the iconic John Hancock Center. The Signature Room offers a three-course prix fixe menu with seatings at 5:30 p.m., 6 p.m., and 6:30 p.m., and a five-course prix fixe menu with seatings at 7:30 p.m., 8 p.m., 8:30 p.m., and 9 p.m. All seatings include a balloon drop at midnight and a complimentary Champagne toast; later seatings are accompanied by live music from Matt Lewis & The Union until 1 a.m. Additionally, The Signature Lounge features a $30 package from 6 p.m.-1 a.m., including one beverage and live entertainment from DJ Megan Taylor from 9 p.m.-1 a.m. After 6 p.m., guests under the age of 21 are not permitted. Pricing for the three-course menu is $125 per person. Pricing for the five-course menu is $225 per person. Includes tax and gratuity. Reservations are required, and can be made by calling 312-280-0465. Somerset- Somerset is offering a delightful pre-fixe menu that will have guests feeling like they are ringing in the New Year at a swanky yacht club. The four-course menu by Lee Wolen will offer a variety of seasonal American dishes and several favorites from the normal menu. For the first course, diners can choose between beef tartare, bay scallop crudo and roasted broccoli salad. Guests can then opt for mushroom tagliolini, butter poached lobster or seared foie gras for their second course, followed by tasteful options for the third course including poached black bass, roasted beef tenderloin, black truffle stuffed chicken or grilled lamb loin. To finalize the delicious experience, diners can delight in dessert choices such as bittersweet chocolate mousse, mont blanc tart or a passionfruit parfait. Thompson Chicago- What better way to close out a year than in your own private Penthouse in the heart of Chicago’s Gold Coast? Thompson Chicago invites couples to ring in the new year all December long in one of Thompson’s bi-level Penthouse suites. Start the night out with complimentary Champagne and a Fruits de Mer platter for 2-4 guests from Thompson’s onsite restaurant Nico Osteria. For an extra special touch, caviar service* can be enjoyed as you take in views out the floor-to-ceiling windows that overlook the city; the background to your intimate and sophisticated “cheers” to the year ahead. When midnight rolls around, so will Thompson’s team, with a special delivery of chicken with wilted spigarello, spinach, & pecorino jagas from Nico, and more bubbly of course. To book for stays between December 1 – December 31, please visit here. Rates start at $1,700 per night; reservations are subject to availability and require 72-hour advance booking. 48-hour cancellation policy applies. *Caviar service supplement can be added for $20 per guest. Torali- Say goodbye to 2017 and hello to 2018 this new year at the Ritz-Carlton, Chicago’s recently opened restaurant, Torali Italian – Steak. Twinkling tones adorn the 12th floor with offerings that include a Surf & Turf special, NYE desserts and festive holiday cocktails in addition to the daily dinner menu. Toast to the New Year in Torali Bar with complimentary Champagne and light bites at the stroke of midnight. Celebrate New Year’s Day at Torali’s New Year’s Day Brunch on January 1 featuring an a la carte selection of brunch bites and cocktails. Torali Italian – Steak’s New Year’s Eve dinner takes place from 5-10 p.m. on December 31 with Torali Bar closing at 1 a.m. New Year’s Day Brunch takes place from 6 a.m.-3 p.m. on January 1. Reservations are recommended and may be made by calling www.toralichicago.com. 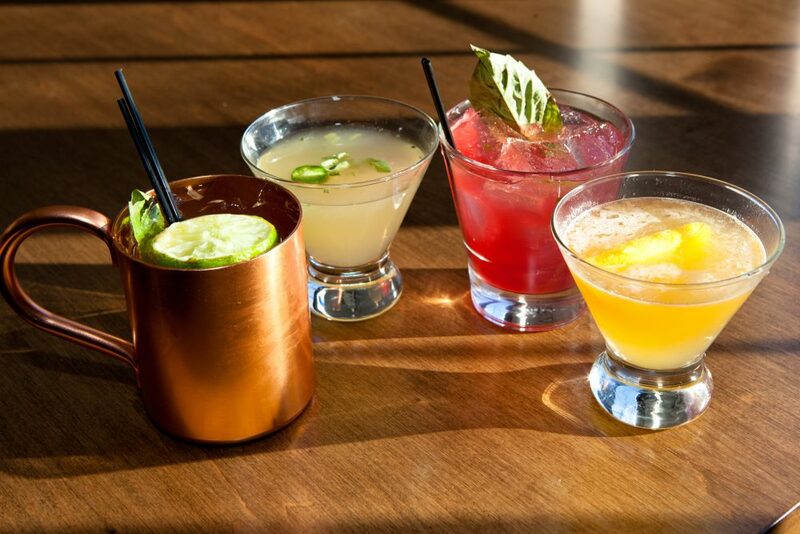 20 East- On New Year’s Eve, 20 East is celebrating early with a night of drinks, dinner, and a Champagne toast. The next morning, guests can enjoy an all-you-can-eat family style brunch from 8 a.m.-7 p.m., including the holiday hot chocolate bar. For $45, start out the year right with Fried Chicken with bacon and pepper gravy; Sriracha Butter Waffles with housemade jam; Cavatappi Chili Mac topped with cheddar; Roasted Garlic Potatoes with truffles; and a Country Apple Tart with salted caramel and whipped cream. Throughout the holiday season, 20 East offers a hot chocolate bar at brunch and for special occasions. There are multiple topping choices included for $6: large and small marshmallows, whipped cream, chocolate pieces, graham crackers, chocolate pirouettes, candy canes, and more. Alcoholic hot chocolates are available for $10. Reservations for New Year’s Eve and New Year’s Day Brunch can be made here. Brunch is only available to tables with a minimum of two people. Heritage Restaurant and Caviar Bar- Build your own tasting, enjoy a la carte options—or take a seat at the bar and go all caviar. Offering seatings at 5:30p + 9p, extended hours and walk-in’s welcome. Split Rail- Split-Rail travels back in time this New Year’s Eve, transporting guests to an enchanted evening aboard the RMS Titanic. Chef Zoe Schor prepares a $60 dinner featuring authentic dishes taken from the White Star Line’s 1912 menu, with some options for decadent first-class upgrades. The restaurant’s dining room will transform into the fated ship herself with turn of the century décor. The set menu is $60 with options for upgrades. Reservations can be made starting at 6 p.m. on December 31 through RESERVE or by calling the restaurant at 773.697.4413. The Promontory- Dare to be decadent with a hearth-grilled tasting menu and newly-launched champagne and caviar service then dance the night away on The Promontory's second floor music venue. Brickhouse Tavern- Join the first-ever NYE celebration at The Park at Wrigley! Brickhouse Tavern is hosting a celebration to remember, featuring an expansive passed food menu, premium drink package, champagne, party favors, exclusive guest list and more included with general admission tickets ($75-$80 per person). Doors open at 9 p.m. and private tables and sections are available to reserve including a high top table for four people ($100), high top table for 8 ($200), celebration booth for 8 ($300), superior booth for 10 ($350), luxury table for 10 ($400) and congregating table for 12 ($400). Reserved tables include assorted food trays, dedicated server, Ketel One premium vodka and champagne (one bottle each per table; two bottles each for luxury table for 10 and congregating table for 12). To purchase tickets, please visit www.BrickhouseTavernChi.com or call (312) 579-3637. PR Italian Bistro- Celebrate with PR's regular brunch & dinner menus + chef's blackboards featuring their foodie countdown: most popular dishes of 2017! Exciting, sparkling cocktail creations; fun vibes & friendly faces await your NYE celebration at PRIB. PR Italian Bistro takes Reservations for any size party until 9pm. Wood- 4-COURSE DINNER + NYE EDITION OF LATE NIGHT WOOD DANCE PARTY — WOOD: Enjoy a Michelin-worthy prix-fixe menu and dancing. Ada Street- Begin with a ceremonial drink on your way to enjoying an inaugural celebration. Enjoy craft spirits from an open bar; and Chef Michael Kornick's menu of passed hors d’oeuvres with dishes including Salmon Tartare on nori crackers, Oyster Po' Boy Crostini, and Lamb Ribs. Get ready for an evening you'll never forget, or one you'll fail to remember, the decision is yours. Tickets are $100 per person, inclusive of tax and service, and can be purchased through Eventbrite. Guests who join aliveOne in Lincoln Park to ring in the new year will enjoy an all-inclusive package from open to close. The package will include private access to aliveOne's private back room, top shelf liquor, beer, wine, Red Bull, and a food buffet. Guests will enjoy a champagne toast at midnight and DJ Dan Maloney spinning all night. For tickets, visit http://aliveone.com/event/aliveone-new-years-eve-party/. Group discounts are available for guaranteed groups of 10 or more. For more information, contact aliveOne via their private events contact form at http://aliveone.com/private-parties/. Boka- BOKA will be offering two seating options to ring in 2018! The first seating will be from 5:00-7:00 and will exclusively offer a five course menu ($120/person). The second seating will be from 7:30-11:00 and will exclusively offer a seven course menu ($150/person). Optional wine pairings ($55 standard/$125 reserve) are also available. There is no a la carte menu available. Fish Bar- Feelin' crabby and don't want to go out on New Year's Eve? This year, Fish Bar is ditching traditional New Year's stuff. Ring in the New Year with All You Can Eat Crab, a prix fixe NYE dinner menu, or the good ol' regular menu. The prefixed dinner starts off with an oyster shooter, curry scented lobster bisque, a wedge salad, and ends with all you can eat crab, both King and Snow – the choice is yours! The prix fixe dinner menu is $85 per person, inclusive of tax and service, and can be purchased through Eventbrite. Geja's Cafe- Geja’s Café will offer New Year’s Eve revelers a romantic repast featuring fondue and champagne in a festive, yet intimate, atmosphere complete with classical/flamenco guitar music. Geja’s Café will feature three special reserved seatings on Sunday, December 31, 2017. 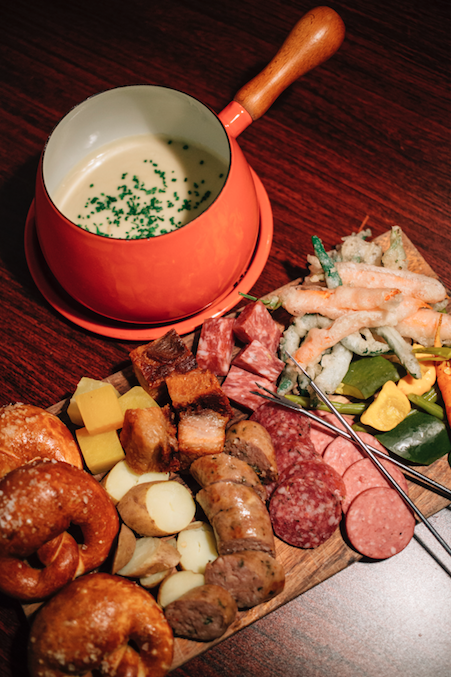 Reservations are available for 5:00 p.m., 7:30 p.m. and 10 p.m. All guests will enjoy a four-course fondue dinner complete with cheese fondue appetizer, salad, lobster, shrimp and beef entree and Geja’s famous flaming chocolate dessert fondue. The evening’s packages also include champagne and tax and gratuity! The 5:00 p.m. seating is $95 per person and includes a glass of Chandon Brut Sparkling. The 7:30 p.m. seating is $115 per person and includes a glass of Moet Brut Champagne. The 10:00 p.m. seating is $130 per person and includes a bottle of Etoile Rose Sparkling per couple with party favors galore for the countdown to midnight. Long acclaimed “Chicago’s Most Romantic Restaurant,” Geja’s Cafe offers guests an enchanting setting; intimate, candle-lit wine cellar atmosphere and private booths, together with an extensive list of fine, moderately priced wines. To purchase tickets or for more information on the New Year’s celebration; go towww.gejascafe.com or call Geja’s Café at 773-281-9101. J. Parker- There is no better way to ring in the new year than high above the city on one of Chicago’s most iconic year-round rooftop bars, J. Parker. Party the night away at a Roaring 20’s themed New Year’s Eve party with music from DJ Kareem from 8pm - 1am and an array of passed appetizers. Guests can also enjoy a premium drink package from 9pm - 1am (shots are not included). As a final adieu to 2017 and proper welcome to 2018, J. Parker will serve guests an exclusive champagne toast at midnight. The Kennison- The Kennison is offering a five-course prefix dinner on New Year’s Eve. Guests can opt for the standard pre-fixe menu at $75 per person, or they can enhance the experience with wine pairings for each course at $110 per person. Guests who dine at Tuscany on Taylor for New Year's Eve will enjoy dinner specials created by Executive Chef Victorio Padilla. There will be complimentary party favors and a champagne toast at midnight. The regular menu will also be available and reservations are highly recommended. Party-goers that visit The Owl for New Year's Eve will enjoy an all-inclusive package for $75 per person from 8 p.m. to 1 a.m. which includes top shelf liquor, beer, wine, Red Bull, and a food buffet. The evening will feature a champagne toast at midnight as well as DJ Adam Luksetich (Numero Group) spinning all night. For tickets, visit http://owlbarchicago.com/event/owls-nye-party/. For the night owls looking for a New Year's Eve after party, The Owl will be open to the public from 1 a.m. to 4 a.m. Group discounts for are available for guaranteed groups of 10 or more. For more information, contact The Owl via their private events contact form at: http://owlbarchicago.com/private-parties/. The Whistler- Sip on the Logan Square hot spot's favorite cocktails from 2017 during the annual dance party. Still haven’t made plans for New Year’s Eve...? Link in bio! AceBounce-This New Year’s Eve AceBounce is ringing in the New Year and howling at a full moon. In typical Full Moon Party tradition- AceBounce will have a UV lit neon world- complete with décor, black light make-up artists, champagne toast, appetizers, and a 4 hour premium open bar from 9pm-1am. Cambria Chicago Loop - Theatre District, 32 W. Randolph, is hosting a special New Year’s Eve and New Year’s Day Brunch with bottomless mimosas and a build-you-own waffle station, the brunch is a great way to kick off, or recover from, New Year’s celebrations. The hotel’s brunch will be held on New Year’s Eve and New Year’s Day from 8am to 2pm at Intermission, their lobby restaurant. Intermission, which is located in the heart of the theatre district in downtown Chicago, is a great spot for people to grab a bite before catching a show on New Year’s Eve, or to recover after a long night of celebrations. Brunch-goers will enjoy bottomless mimosas, or a Bloody Mary bar, a carving station, featuring prime rib and ham, a Chef Omelet station, and a build-your-own waffle station. Guests can also choose from classic brunch selections like Eggs Benedict, a variety of flavored scrambled eggs, sausage, bacon, breakfast and house made pastries and desserts. The brunch is available for $39.99 per person and is open to the public. Check out www.cambriachicagoloop.com for more information. Cindy's-The rooftop restaurant perched atop the historic Chicago Athletic Association hotel offers guests three chances for funk and soul reflection to close out 2017 and welcome 2018. DJ Dave Mata’s Uptown Downtown spins an all vinyl set of vibrant soul music from every corner of the globe during daytime brunch on Sunday, December 31, prior to the restaurant’s first ever New Year’s Eve party. Guests can enjoy Chef de Cuisine Keith Potter’s canape selection beginning at 9 p.m. alongside bubbles selected by Sommelier Sterling Knight. The party continues with more soulful sounds from DJ Dave Mata of Soul Summit and Impala Sound spinning through the night as the ball drops at midnight and toasts abound. The next day, guests welcome 2018 with New Year’s Day brunch, feasting on the shareable large format plates and platters such as Buttermilk Pancakes with yuzu & lemon curd, blueberries, and Chantilly or the Shellfish Platter featuring Maine lobster, oysters on the half shell, king crab, and accompaniments. Cindy’s is open for Sunday brunch on New Year’s Eve from 10 a.m.-2 p.m., with dinner service from 4-8 p.m., and the party beginning at 9 p.m. New Year’s Day brunch is served at 10 a.m. on Monday, January 1. For more information and to make a reservation, please visit www.cindysrooftop.com or email nlarose@chicagoathletichotel.com. ENO- Toast the New Year with ENO Wine Room! Wine lovers are invited to gather friends and loved ones to ring in 2018 eight times over, as ENO celebrates with a featured sparkling wine popped every hour beginning at 5 p.m. on December 31. Located along the Magnificent Mile, guests will enjoy ENO's cozy atmosphere, festive decor and prime downtown location, while sipping on crisp pours from around the world. The featured bubbles for the New Year's Eve celebration are available for $10/half-glass. It's midnight somewhere, and ENO Wine Room is the perfect place to celebrate! To make reservations and for additional information, please call 312-321-8738 or visit ENO's website. Howell's and Hood and Sweet Water Tavern- Bottleneck Management’s participating Chicagoland beer bars welcome 2018 with Brew Year’s Eve. Guests can enjoy a three-course prix fixe menu with carefully selected beer pairings for a special New Year's Eve dinner, a Champagne toast at midnight, and a video DJ playing videos along with ideal party music to usher in the new year. Patrons are invited back the next morning for a New Year’s Day recovery brunch to start the year off right, with menu items such as the Stuffed French Toast with vanilla bean ice cream battered brioche bread, Bailey's cream cheese, mixed berry compote and powdered sugar, and the Pork Benedict with smoked pork shoulder, poached eggs, and BBQ hollandaise on an English muffin with habanero hash browns and pico de gallo. Reservations are encouraged for New Year’s Eve and New Year’s Day. Menu prices vary by location. Reservations for each respective restaurant can be made at the following links: Howells & Hood, Sweetwater Tavern & Grille, Old Town Pour House Oak Brook, Old Town Pour House Naperville. JW Marriott-Toast to 2018 with music, bites, a confetti cannon and more at the downtown Loop hotel, JW Marriott Chicago. Enjoy all the party perks under one roof with the landmark hotel’s New Year’s Eve celebration to remember with multiple rooms, hors d’oeuvres and more. With rates starting at $404, guests are invited to book their NYE soiree & VIP packages with the option to book additional room nights at a special promotional rate of $174 per night. For full party details, visit www.chicagonewyearsparty.com. To book the New Year’s Eve Soiree or New Year’s Eve VIP package, visit www.marriott.com/hotels/hotel-deals/chijw-jw-marriott-chicago. London House- To ring in the new year, LondonHouse Chicago hosts a New Year’s Eve celebration at the hotel’s Juliette Grand Ballroom, which boasts floor-to-ceiling windows overlooking the Chicago River and the city’s glittering downtown. Guests looking to revel 2017’s end and start of a new year may enjoy free-flowing Champagne and cocktails, a live musical performance by modern rock band Mike and Joe, a live DJ, passed hors d’oeuvres, a midnight breakfast buffet, and complimentary party favors and noisemakers. In addition to the ballroom celebration on the hotel’s third floor, the tri-level rooftop venue at LondonHouse Chicago, LH Rooftop, will also host a New Year’s Eve party on floors 21, 22, and 23. Tickets to the luxe New Year’s Eve festivities at LondonHouse Chicago Juliette Ballroom begin at $100 and may be purchased here. Mercat a la Planxa- This New Year’s, the South Loop restaurant rings in 2018 with a creative menu of Catalan-inspired eats from Barcelona native Chef Diego Amat. The restaurant offers a variety of tasting menu options with dishes like grilled wagyu beef served with aromatic herb butter and crispy potatoes. Besides dinner, the restaurant will also be open for a festive New Year’s Eve brunch.The New Year’s menu is offered starting at 5 p.m. on December 31. Brunch is also available from 7 a.m.-3 p.m. that morning. Guests can make reservations by calling 312-765-0524. Raised, An Urban Rooftop Bar- Raised, An Urban Rooftop Bar, 1 W. Wacker Drive, is inviting Chicagoans to ring in the New Year in style at their ticketed New Year’s Eve party on Sunday, December 31 from 9pm to 1am. The third-floor rooftop hangout, which boasts panoramic views of the Chicago river and city skyline, will be offering a special Premium Drink Package that includes champagne cocktails from 9pm to midnight. Tickets are $150 and can be purchased HERE. Roof on theWit- ROOF on theWit, 201 N State Street, will be hosting a Monte Carlo-inspired New Year’s Eve Bash to ring in 2018 from 9:30 p.m. to 2:00 a.m. on Sunday, December 31. Those who purchase tickets, which range from $150 to $3,000, will have access to gambling tables, a premium open bar, that includes Absolut Elyx and Avion Tequila, and entertainment from Chicago DJ, Flipside. The event, which will be set 27 stories above the bustling city, will feature several food stations, including fresh oysters, a Wagyu beef tenderloin carving station, and a seafood display with ceviche and crudo. All guests can also take part in the complimentary GH Mumm champagne toast at midnight. The beverage package, which starts at 9:30pm, will end at 12:30am. Packages range from $850-$3,000 and include VIP seating, VIP ROOF access with early entry at 9:00 p.m., private bottle service and vouchers for complimentary New Year’s Day Brunch at State and Lake Tavern. Those attending must be 21 years of age to enter. Seven Lions- Seven Lions celebrates the holiday season with uniquely delicious Christmas Eve and New Year's Eve menu specials. Guests can leave the cooking up to the Magnificent Mile clubhouse, with flavorful, one-of-a-kind dishes from Executive Chef Patrick Russ. The featured menu includes: Blackened Diver Scallops, Roasted Venison and Tres Leches Cake. To top it off, guests can toast the meal with Comte Audoin de Dampierre Champagne. After all, there's no better way to celebrate than with bubbles! In addition to regular dinner service, these menu specials will be served Christmas Eve from 4-9 p.m. and New Year's Eve from 4-11 p.m. Reservations are highly recommended and can be made online or by calling 312-880-0130. Staytion- Staytion, 1 W. Wacker Dr, is excited to continue its Celebrate the Neighborhood Series with a very special New Year’s Eve event, Cheers to the New Year, for both guests and locals alike. Cheers to the New Year takes place from 6:00 p.m. to 1:00 a.m. Sunday, December 31, offering guests the perfect downtown spot to ring in the New Year with local sips and bites while enjoying live music, DJ beats and each other’s company. Vol. 39- BURLESQUE + BUBBLES — A 1920S SWINGING SOIREE — VOL. 39: Throwback to the Jazz Age for a night of 1920s glamour. Benchmark- Pop, fizz, clink, and dance at Benchmark this New Year’s. Grab your group and head to the Old Town hotspot for an all-in-one experience, including drink packages, champagne toasts (of course), a photographer, DJ, and a rotation of delicious bar bites. Doors open at 9 p.m. and drinks will be served until last call. Purchase tickets ($100) at www.BenchmarkChicago.com or directly at this link. Old Town Pour House- Chicago’s craft beer bars ring in the new year with the “Go Out in Style” package at Old Town Pour House and The Boundary. The celebratory New Year’s Eve package, which goes from 9 p.m.-1 a.m., includes guaranteed entry, passed appetizers, and midnight brunch bites including Mini Stuffed French Toast with vanilla ice cream battered brioche bread, Bailey’s cream cheese, and powdered sugar, and Mini Breakfast Sandwiches on a green onion cheddar biscuit with a breakfast sausage patty, aged cheddar, and scrambled eggs. The night also offers a Champagne toast at midnight, Champagne bottles for $20.18, a video DJ showing 2017 hits leading up to midnight, and Snapchat Spectacles awarded to the snappiest dresser. Partygoers are invited to come back the next morning for a New Year’s Day recovery brunch, not included in the price of the package.Tickets available for $40 per person at Old Town Pour House here. Ticket prices increase after December 25. SteakBar- It’s an “American Hustle” this New Year’s Eve at SteakBar. Get the gang together for a night at Old Town’s multi-level hotspot with party packages for every type of celebration. General admission tickets ($90-$100) include an expansive passed food menu, premium drink packages, a champagne toast, as well as dessert hour and party favors. Doors open at 9 p.m. and private tables and sections are available to reserve, including a luxury booth for 6 ($300), luxury table for 6 ($350), standing high top for 8 ($350), luxury table for 8 ($400), luxury table for 10 ($500), celebration table for 12 ($550), and a private atrium for 20 ($900). Reserved tables include assorted food trays, dedicated server, Ketel One premium vodka and champagne; amounts vary per package. Purchase tickets at www.SteakBarChicago.comor directly at this link. Dusek's Board & Beer - Raise a glass (and a fork) with a multi-course, New Year’s Eve feast from the three-time Michelin-starred restaurant. Punch House- Gather a group for sips and dips with Punch House’s fondue and champagne punch. Arbella- Toast to 2018 in worldly fashion at Arbella’s Silver Lining New Year’s Eve party and dance the night away with DJ Phil Stone on the 1s & 2s. Partygoers celebrate the New Year in their chicest black threads with a premium open bar from 9 p.m.-12 a.m. featuring Avion Tequila, Absolut Elyx, Beefeater, Russels Reserve Bourbon + Rye, Cutwater Spiced + White Rums and passed appetizers. Guests may purchase general admission tickets for $100 (plus tax & gratuity) or get together a group of friends for a VIP Booth for four guests for $700 (plus tax & gratuity). Booths include premier reserved seating for four guests, four premium open bar wristbands, and a complimentary bottle of Perrier Jouet Belle Epoque Champagne (a $250 value) on ice upon arrival. Arbella is open on Sunday, December 31 from 9 p.m.-2 a.m. To purchase tickets, visit Eventbrite. For more information, call Arbella at 312.846.6654 or visit www.arbellachicago.com. General admission is standing room and does not guarantee seating. All guests must be 21+. Additional Eventbrite handling fee not included. Online pre-purchase for admittance only. Fremont- Be whoever you want at Fremont’s masquerade celebration, “A Night in Disguise.” Unmask the New Year with a night full of drinks, dancing, and food. General admission tickets ($125) include a premium bar package, heavy appetizers, and a champagne toast when the clock strikes 12. Doors open at 9 p.m. and private tables and sections are available to reserve, including downstairs table packages for 4 ($700), 6 ($1,200), and 15 ($2,625), as well as upstairs table packages for 10 ($2,000) and 15 ($3,000). Each package includes general admission tickets, bottle of Moet & Chandon champagne, bottle of Tito’s, a porterhouse platter, seafood tower, and a dedicated server; amounts vary per package. Purchase tickets at www.FremontChicago.com or directly at this link. The Godfrey and Dolce Italian- Get swept off your feet and enjoy a New Year’s Eve feast filled with dinner, dancing, and Champagne at Dolce Italian Chicago. Guests will enjoy a taste of inspiration from Fellini’s 1960s Rome with a charming, warm, and contemporary atmosphere complete with seasonal Italian fare. Reservations can be made at www.dolcenye.com. From the fourth-floor perch at The Godfrey, Chicagoans and visitors can ring in 2018 with sweeping city views at I|O Godfrey. Executive Chef Nathaniel Cayer’s kitchen cocktails and elevated American fare will be available throughout the night, whether for a celebratory dinner or bites while festivities take place. Tickets and tables may be purchased here. The Gwen- To celebrate the new year, The Gwen, a Luxury Collection Hotel throws it back to the roaring 20’s for Lux NYE 18. Chef Matt Jergens presents a four-course prix fixe dinner with two seatings at 6:30 p.m. and 9:30 p.m. ($85 per person including complimentary Champagne toast). Dishes include Beef Tenderloin with potato pave, trumpet mushrooms, marrow butter and bordelaise as well as Seared Scallops with roasted squash, torched onions, grilled rabe, and bacon vinaigrette. Wine pairing selections are available for an extra $40 per person. Following dinner, guests are invited to dance the night away until 2 a.m. at the Gatsby-themed Lux New Year’s Party accompanied by the Lydia Cash Band and DJ J-Stereo. Tables are available for $750 and include a bottle of premium vodka and a bottle of Veuve Clicquot Champagne. For those interested in spending the night, room packages start at $399 and include overnight accommodations, a prix fixe dinner for two, and admission to the Lux New Year’s Party. Reservations for Lux NYE 18 can be made by calling Lyndsey.Ingold@thegwenhotel.com. Please visit thegwenchicago.com for more information. Hard Rock Cafe- It's time to kiss 2017 goodbye! Hard Rock Cafe Chicago is celebrating New Year's Eve with an early family-friendly celebration on Sunday, December 31 from 4 p.m.-6:30 p.m. Later in the evening, the cafe will host Rock Around the Clock New Year's Eve presented by ChiTownEvents.com featuring live performances by DJ Ruen and DJ Metro from 8 p.m. until 4 a.m.
Ring In The New Year With Your Lil' Rocker: All ages, 4 p.m. - 6:30 p.m - Hard Rock Cafe Chicago invites families to bring the kids in for a fun-filled New Year's Eve celebration on Sunday, December 31 from 4 p.m. - 6:30 p.m. Upon arrival, families will enjoy a dinner buffet that includes: hamburger and cheeseburger sliders, tupelo chicken tenders, cheesy mac, mini corn dogs and cheese flatbread. After dinner, the fun continues with a dance party featuring a family-friendly DJ, a photo booth and party favors to take home. Once the ball drops at "Early Midnight," or 6 p.m., the Lil Rockers will toast to the New Year with milk and cookies, while adults enjoy a champagne toast. Tickets are $25 for adults and $17 for children ages 10 and under. Rock Around The Clock NYE 2018: Ages 21+, 8 p.m. - 4 a.m. - Hard Rock Cafe Chicago invites guests to rock in 2018 with the hottest New Year's Eve party in town on Sunday, December 31 from 8 p.m. - 4 a.m. Presented by ChiTownEvents.com, Rock Around The Clock New Year's Eve will feature live performances by DJ Metro and DJ Ruen, food, drinks, party favors and more! General admission tickets include an all-inclusive food and drink package from 8 p.m. - 12:30 a.a. with a cocktail reception, an appetizer buffet and a champagne toast at midnight. After 12:30a.m., guests may order beverages from the cash bar. General admission tickets start at $99 per guest. VIP couples and group packages including options for bottle service are also available for purchase. Throughout the night, guests will enjoy music from DJ Metro, the official Chicago Bulls DJ, along with DJ Ruen of S.K.A.M., a leading talent/DJ booking agency that represents many high profile and talented celebrities. To purchase tickets or for more information on New Year's Eve packages at Hard Rock Cafe, please visit www.hardrock.com/chicago. Headquarters Beercade- On Monday, January 1, hold down the fort at River North’s nostalgia-tinged beercade as the space transforms into a life-size childhood fantasy—a New Year’s Day Blanket Fort Party. All 14,000-sq. feet are fair game in the creative fort construction, and a designated area will be set aside for feather-filled pillow fights. Blanket fort-appropriate attire is encouraged, which translates to staying in comfortable PJ’s or fully committing to rocking an adult onesie. Beverage Director Zach Rivera serves up special cereal-infused cocktails for the event and throws a pizza party to provide fort-building fuel. Headquarters will have materials (blankets) on-site, but guests are welcome to BYO-blankets, which will be donated to charity following the event. Coverage leading into the college football bowl games will be aired on TVs across the bar and DJs will be spinning all afternoon. Together, HQ and inventive Chicagoans everywhere can reach their 2018 goal of using thousands of yards of blanket to craft the largest blanket fort River North (or the world?) has ever seen. Headquarters’ Blanket Bowl runs from 12-4 p.m. Tickets cost $25 per person (includes entry, 4 drinks, and pizza) and can be purchased here. For more information, log on to www.hqbeercade.com. Headquarters also caters to concert-lovers this New Year’s Eve offering not one, but ten opportunities for attendees to win a pair of tickets to the concert of their choice in 2018. Resident DJ Brock Manke keeps the dance party alive with the winners of the concert ticket giveaway being announced every hour on the hour. Tickets start at $60 for well cocktails and $70 for premium drinks. Both price points include chef-driven food and a Champagne toast at midnight. Headquarters Beercade is open 365 days a year; the New Year’s Eve celebration runs from 9 p.m.-2 a.m. Tickets are available via the Headquarters Beercade website. Henry's- Henry’s and The Rec Room are going BOTTOMLESS! Yeah, you heard it right, BOTTOMLESS! Pants optional. Kidding...please wear pants. Bottomless drinks of all shapes and sizes will be offered. You can pick how you want to party this NYE with three ticket options. DJ's will be bumpin' tunes and there will be a midnight buffet that will make you say, "I'm lovin' it". All tickets include general admission, bottomless cup, midnight buffet, and midnight toast. Ticket options include: $50 Bottomless Blue: Bottomless Draft Beer, Red & White Wine & Henry's Punch Bowl; $75 Bottomless Red: Bottomless Draft Beer, Red & White Wine, Henry's Punch Bowl & Draft Cocktails; $100 Bottomless Yellow: Bottomless Draft Beer, Red & White Wine, Henry's Punch Bowl, Draft Cocktails & Mixed House Spirits. All tickets can be purchased through Eventbrite. Joy District- Ring in the New Year with Joy District Sunday, December 31. General admission tickets start at $105. Joy District will host a River North New Year's Eve Party with general admission ticketing and a premium bar package from 9p.m. to 1 a.m. Guests will enjoy passed hors d'oeuvres and dessert from Executive Chef Matthew Wilde, access to a hosted champagne bar from 8 p.m. to 9 p.m., access to both floors including the nightclub, live music from Chicago's top DJ's, a champagne toast at midnight, and more. VIP table with bottle service are also available. For complete ticket information and pricing, visit http://eventstand.com/events/JOYNYE2018. Lawry's The Prime Rib- Lawry’s The Prime Rib invites Chicagoans to toast to the New Year at the former McCormick Mansion, adorned with lights, Christmas trees and holly, to keep the holiday spirit flowing into the new year. Diners can feast on a traditional prime rib dinner with all the fixings, such as the Famous Original Spinning Bowl Salad, Mashed Potatoes, Yorkshire Pudding, and more, while carolers stroll about the restaurant enchanting the halls with holiday favorites. Lawry’s is open from 5-9:30 p.m. on New Year’s Eve. Reservations can be made online here. Marshall's Landing- For the first time in its 90-year history, the Merchandise Mart throws a one-of a-kind New Year’s Eve celebration at Marshall’s Landing, the restaurant & lounge atop theMART’s Grand Stair. Chicagoans can indulge in an expansive passed food menu from DMK Restaurants, premium drink packages, a midnight countdown with a Champagne toast, and party favors – all while soaking up views overlooking the Chicago River. Ticket options range from general admission ($95) to a private VIP Lounge ($1,000). Marshall’s Landing is open from 9 p.m.-2 a.m. on Sunday, December 31. Tickets and packages are available for purchase via the Green Curtain Events website. Additional information can be found on the Marshall’s Landing website, as well as the lounge’s Instagram and Facebook pages. Mercadito- Adios 2017, y Bienvenito 2018! Mercadito Chicago, River North's Mexican restaurant (108 W. Kinzie St.), is ringing in the New Year on Sunday, December 31 with a selection of celebration packages available throughout the day. Mercadito will be open for dining before New Year's Eve festivities, with brunch and lunch seatings available from 11 a.m. - 3 p.m., and the First Seating available from 3 - 7:15 p.m., where guests can enjoy a la carte items off Mercadito's regular menu. Reservations are required. Second Seating features a choice of Five-Course Sharing Menu, courtesy of Executive Chef Patricio Sandoval, and a cash bar. The Second Seating is from 7:30 - 8:45 p.m., with a two-hour time limit. Reservations are required. Last Seating features a Special NYE Five-Course Sharing Menu and Open Bar, With Reservation. The Last Seating is from 9:30 - 10:45 p.m. and ends at 3 a.m. Tickets for the dinner are $45 per person plus tax and gratuity, with an additional $50 per person for access to the 2.5 hour open bar. To make your reservations for any of Mercadito's New Years celebration packages, visit www.mercaditorestaurants.com/new-years-eve-2018/. SafeHouse- SafeHouse Chicago will be celebrating New Year’s Eve all day long with their Spies Around the World Celebration on Sunday, December 31ststarting at 11am. Fun for the whole family, those who visit SafeHouse will be treated to a complimentary glass of sparkling grape juice, or sparkling wine, for special spy-themed New Year’s Eve toasts every hour from 2pm-6pm. When the clock strikes 10pm, the real New Year’s Eve party will begin. Hosting their first ever New Year’s Eve Shag-a-delic Dance Party, SafeHouse will be ringing in 2018 with sparkling wine toasts both at 11pm and midnight, as some spies are still operating on New York City time. Throughout the evening, agents will enjoy a variety of different cocktail deals and a “Random Open Bar,” offering complimentary well cocktails, wine and domestic drafts of beer for short periods of time. A $50 prize will be awarded to both the best dressed male and female, and a $100 will go to the best dressed couple. The clearance fee (cover) for this event is $10. For $50, spies receive a special wristband that offers access to an open bar throughout the night and a VIP bartender. For more, visitwww.safehousechicago.com. Tanta- Tanta invites guests to toast to the new year with elevated Peruvian specials from Chef Jesus Delgado. Sharable seasonal dishes to end 2017 include Cebiche Poderoso, an elevated take on Tanta’s classic cebiche featuring uni leche de tigre; Tiradito Chacrero, a wagyu carpaccio with parmesan foam, truffle oil chalaca and crispy quinoa; Codillo de Cerdo, a crispy pork shank with Peruvian corn pepian, panca and cranberry jam; and Plancha Chifera with Alaskan king crab, clams, market fish, taro root, sesame & black bean sauce. Tanta’s New Year’s specials, in addition to the traditional dinner menu, are available from Friday, December 29 through Sunday, December 31 starting at 5 p.m. daily. Tanta will be closed on New Year’s Day, January 1. Reservations are recommended and can be made by calling OpenTable. For additional information, please visit www.tantachicago.com, Facebook, Twitter, or Instagram. Tortoise Supper Club- Co-owners Keene & Megan Addington invite you to ring in the New Year in style with a supper club-style celebration! Kick the night off off with a classic cocktail like a Manhattan, Antique Whiskey Sour or Calvados Sidecar. Beginning at 4:00 pm the River North restaurant will be serving an à la carte menu with signature TSC favorites plus a few holiday specials created by Executive Chef Aaron Browning. Indulge in a 20 oz. Bone-In Ribeye with Marrow Butter & Crispy Onions or Chilean Sea Bass with Coconut Rice, Shrimp Ragout and Sautéed Watercress. Since live music is a staple of an authentic supper club (and a key element to any great party,) Live Jazz Music will be playing Frank Sinatra-style lounge music from 7:30 pm – 11:00 pm. A DJ will take over from 11:00 pm – 2:00 am to keep the party going into 2018. Guests will toast to the official arrival of 2018 with a complimentary champagne toast at midnight before dancing the night away on a lighted dance floor. Adding to the ‘Mad Man’ feel of the evening, festively-dressed flapper girls will circulate with old school cigarette cases filled with complimentary New Year’s Eve flair like party hats, confetti popper and more. Tortoise Supper Club’s bar and kitchen will be open until 1:30 am. Reservations are recommended and are available between 4:00 pm – 1:30 pm (Tortoise Supper Club’s kitchen will remain open until 1:30 am for guests looking for a late-night nosh.) Accepting Reservations from 4:00 pm – 1:30 am. There will be a minimum of $50 per person and for any cancellation not made prior to 48 hours before, the party will be charged the full amount. Commonwealth will open for brunch at 10 a.m. on New Year's Eve and broadcast the Dallas Cowboys vs Philadelphia Eagles game at 12 p.m. As a Cowboys-affiliated bar, game day specials will include $2 Pork Tacos, $4 Tecate Cans, $5 Miller Lite stadium cups and $5 vodka lemonades. Brunch highlights include a $3 Build-Your-Own Mimosa Bar with various fruits and juices and a $6 Build-Your-Own Bloody Mary Bar stacked with hot sauces, veggies, meats and more. Menu highlights include Brunch Schnitzel (herb aioli, smoked potatoes, pickled red onion, fried egg; $14), Pig Muffin (maple pig head, farm egg, American cheese, English muffin; $12), and Kentucky Hot Brown (smoked turkey, bacon, tomato, beer cheese, sourdough, $14). Chicagoans who ring in the new year with Commonwealth Tavern will enjoy a $60 per person package beginning at 8 p.m. which includes microbrew drafts, domestic bottles, call drinks, wine, an appetizer buffet, party favors and a champagne toast at midnight. For tickets, visit www.commonwealthchicago.com. Hosts who book a party of 20 or more will receive free admission. For parties of 40 or more, both the host and one guest will get in free. To book group reservations for 10 or more guests, email info@commonwealthchicago.com. On New Year's Eve, Tavern on Little Fort will open at 10 a.m. for guests to enjoy brunch until 3 p.m. before the Oakland Raiders vs Los Angeles Chargers game kicks off at 3:25 p.m. A Raiders-affiliated bar, Tavern on Little Fort's game day specials include $3 domestic bottles, $5 Lagunitas IPA and $7 soft pretzels. Brunch highlights include the Breakfast Burger (70-percent brisket and 30-percent bacon patty, tavern sauce, bread and butter pickles, fried egg, New England bun; $15), Breakfast Bagel (ham, scrambled egg, beer cheese; $12), and Vegetable Frittata (asparagus, tomato chile relish, aioli, parmesan; $12). Featured drink specials include a $3 Build-Your-Own Mimosa Bar and $5 Build-Your-Own Bloody Mary Bar. Chicagoans who ring in the New Year at Tavern on Little Fort will enjoy a $40 per person package beginning at 8 p.m. which includes microbrew drafts, domestic bottles, call drinks, wine, appetizer buffet, champagne toast at midnight and party favors. For tickets, visit www.littleforttavern.com. Hosts who book a party of 20 or more will receive free admission. For parties of 40 or more both, the host and one guest will get in free. To book group reservations for 10 or more guests, email info@littleforttavern.com. the Albert- For a special night in celebration of 2018, the Albert will be featuring a pre fixe menu of items including Matsutake Mushroom Chawanmushi with Scallion and Sorrel, Belgian Endive with Black Truffle, Orange and Pine Nuts, Aged Duck (several preparations), and Chocolate Strawberries and Champagne. The cost is $125 per person with a $75 optional beverage pairing. For more information, visit www.thealbertchicago.com. Sunday, December 31 from 9 p.m. to 2 a.m.
General Admission tickets include premium top shelf drinks and a Stefani Signature Restaurants food station from 9 p.m. to 2 a.m. with access to over 20 premium liquor bars, red carpet with step and repeat, party favors, and a champagne toast at midnight. Guests will enjoy music from Chicago's best DJs as well a premier view of the midnight fireworks show from a private terrace for Crystal Gardens' guests only. Party-goers will also receive an official after-party wristband. Guests can opt for VIP tickets, starting at $149, to enjoy all the benefits of general admission tickets plus express admission at 8:30 p.m., separate VIP express entry line, first chance to get tables, a special gift and more. Reserved Guaranteed VIP tables start at $199 per person and guests receive a VIP ticket plus a guaranteed table for two to eight people and one to four bottles of champagne based on the table size purchased. GreenRiver- Executive Chef Aaron Lirette and the GreenRiver team provide an intimate dining experience this New Year’s Eve, offering its Michelin-starred tasting menu for two seatings. The first seating consists of five courses ($125/person) with desserts prepared by Executive Pastry Chef Ji Hyun Yoon. The second seating begins at 8:30 p.m. with an additional sixth course ($155/person) and a Champagne toast at midnight. Highlights from the menu include Trout Tartare Parfait with egg, crème fraiche, chive, and trout roe and Wild Mushroom Agnolotti with sherry cream, La Tur cheese, and black truffle. Optional wine pairings to accompany the first seating ($55/person) and second seating ($75/person) are available in addition to a limited selection of cocktails from Head Bartender Amit Gilad and team. GreenRiver opens on Sunday, December 31 at 5:30 p.m. for the first seating with the last seating starting at 8:30 p.m. and concluding at 10:30 p.m. For additional information about GreenRiver visit the restaurant's website and follow them on Instagram, Twitter, and Facebook. Bellemore- Boka Restaurant Group’s stunning new restaurant led by executive chef / partner Jimmy Papadopoulos is hosting diners on New Year’s Eve and treating them to six courses of decadence. Start the meal with dishes like venison tartare and braised lamb belly, followed by entrees like the 21-day dry-aged duck and wagyu strip with braised beef cheek. The cost is $85 per person with luxurious add-ons like the Instagram-famous oyster pie and truffles. Wine pairings are an additional $45. Carnivale- Carnivale, the global Latin-Fusion restaurant, located in Chicago's West Loop neighborhood presents Great Gatsby NYE on Sunday, December 31, 2017. Guest are invited to ring in the new year with a "Great Gatsby" theme complete with live aerialist entertainment, a live DJ from 6 PM to 1 AM, a table side photographer, specialty New Year's Eve menu, and a midnight balloon drop and champagne toast for guests staying through the New Year. Dinner reservations are required by calling 312.850.5005 and will begin at 4 PM, all reservations from 9:30 PM and later are invited to help ring in the year. Eden- Guests will start the holiday with NYE Brunch at Eden, featuring Chef Devon Quinn’s menu of indulgent dishes, such as the sweet Panettone French Toast, or the savory Grilled Skirt Steak & Eggs – full brunch menu here. Bottomless mimosas will run the show at NYE brunch, served from 10 a.m. to 2 p.m. and priced at $30, and lead to a sweet treat to-go at Eden’s newly-launched bakery bar. Eden’s NYE Dinner will feature the full a la carte menu with seasonal highlight dishes at the forefront, including the Tea-Brined Berkshire Pork Chop, Beef and Veal Lasagna and Painted Hills Beef Carpaccio. Guests will then ring in the new year at the restaurant with a midnight champagne toast. Esco Bar- Esco Bar invites guests to put their dancing shoes on and ring in 2018 with a night of food, drinks and live music. For $80, guests have access to passed appetizers from Ronero and a premium open bar from 8 p.m.-12 a.m. At midnight, a complimentary Champagne toast marks the beginning of the new year. Tickets are $80 and can be purchased by calling ronerochicago.com/escobar-nye-2018. Federales- Channel your inner celebrity and celebrate the evening in style with Hollywood Night at Federales. Dress to impress, as this hotspot will be decked out with a red carpet and paparazzi snapping photos throughout the event. The night will be featuring a premium bar package from open to close (9 p.m. – 2 a.m.), extensive buffet, and a champagne toast to ring in the new year. Purchase presale tickets ($75) or general admission tickets ($100) at www.FederalesChicago.com or directly at this link. Table reservations are also available for large groups by contacting colleen@fourcornerstaverns.com or by calling here. Little Goat Diner- For the second year Little Goat Diner is going back in time, to the funky fresh 70s! Goat down tonight at Little Goat, complete with disco ball, dance floor and DJ, several bars, food stations and hors d'oeuvres. From 8:30pm-1am, guests can experience a full belly and loads of drinks including champagne, craft beer, signature cocktails and wine. The only thing you need to worry about is how to disco, drink bubbles, and snack at the same time! Ronero- Ronero wraps up the end of 2017 with Chef Trevor Cole’s four-course prix fixe dinner. Dishes include Carne Ronero (12 oz. of skirt steak, beef fat chimichurri, confit garlic) and Arroz de Lisa (market fish, garlic rice, yucca, carper vinaigrette, alinos). For an optional upgrade, guests can opt for the El Gran Show course for a choice of Pescado Frito (Colombian-style whole fried red snapper, coconut-cola rice, fried plantain, pickled mango, grilled orange) or the Picanha (16 oz. churrasco style rump steak, rice, farofa, Brazilian vinaigrette). The prix fixe dinner has an early seating from 5-7 p.m. ($80 per person with a $20 optional wine & cocktail pairing) and a late seating from 7:30-10 p.m. ($100 per person with a $25 optional wine & cocktail pairing). Reservations can be made by calling ronerochicago.com. Salero- Spice up your holiday with a little Spanish flair with Salero's 12 Grapes of Good Luck: New Year's Eve in Spain. Roots- Family New Year Party on Dec. 31st including a champagne toast and mozzarella sticks. The Boundary- Chicago’s craft beer bars ring in the new year with the “Go Out in Style” package at Old Town Pour House and The Boundary. The celebratory New Year’s Eve package, which goes from 9 p.m.-1 a.m., includes guaranteed entry, passed appetizers, and midnight brunch bites including Mini Stuffed French Toast with vanilla ice cream battered brioche bread, Bailey’s cream cheese, and powdered sugar, and Mini Breakfast Sandwiches on a green onion cheddar biscuit with a breakfast sausage patty, aged cheddar, and scrambled eggs. The night also offers a Champagne toast at midnight, Champagne bottles for $20.18, a video DJ showing 2017 hits leading up to midnight, and Snapchat Spectacles awarded to the snappiest dresser. Partygoers are invited to come back the next morning for a New Year’s Day recovery brunch, not included in the price of the package. Tickets available for $40 per person at Old Town Pour House here and $70* per person at The Boundary here(*price includes four-hour premium bar). Ticket prices increase after December 25. Easy Bar in Wicker Park will host a "Decades" themed New Year's Eve party with an all-inclusive package from open to close and a Taco Toast at midnight featuring Taco Bell tacos paired with a Miller High Life served in a champagne coupe glass. The package will include private access to the back room, top shelf liquor, beer, wine, Red Bull, and a food buffet. DJ Substance D will spin music from the 70s, 80s, 90s and today. For tickets, visit http://easybarchicago.com/event/easy-bar-decades-new-years-eve-party/. Group discounts are available for guaranteed groups of 10 or more. For more information, contact Easy Bar via their private events contact form at http://easybarchicago.com/private-parties/. Located in the heart of the Six Corners in Chicago's Bucktown neighborhood, Estelle's will throw a 90s-themed New Year's bash. The evening will feature an all-inclusive package from 8 p.m. to 1 a.m. with top shelf liquor, beer, wine, Red Bull, and a food buffet. Estelle's will have a DJ spinning 90s tunes all evening and a toast at midnight with Hamm's in champagne coupe glasses and hamburgers. 90s themed cocktails will also be available. Select items from the Estelle's menu will be available a la carte all night. For tickets, visit http://estelleschicago.com/event/hammer-time-90s-nye-party/. Starting at 1 a.m., Estelle's will be open to the public for the New Year's after party until 4 a.m. Group discounts for are available for guaranteed groups of 10 or more. For more information, contact Estelle's via their private events contact form at http://estelleschicago.com/private-parties/. Kizuki invites guests to fuel up before heading out to their New Year's Eve parties with over 10 bowls of ramen. Highlights include Tonkotsu Shoyu Ramen (rich pork broth flavored with Yamaguchi soy sauce, topped with black garlic oil), hearty, rich and full of flavor, and Yuzu Shio Ramen (French sea salt, kelp and Japanese citrus based), a unique, refreshing ramen unlike the traditional ramen stereotype of meaty and creamy. While dining, patrons can warm up with seasonal Japanese-inspired hot cocktails including a Japanese take on mulled wine called Fuyu's Koshu (Pinot noir, Haku Sake, Akama Shochu; $9 glass, $17 half pitcher, $33 pitcher), Fuyu's Toddy (Japanese whisky and plum whisky garnished with a cinnamon stick; $9 glass, $17 half pitcher, $33 pitcher), and Fuyo's Ocha (Japanese whisky, Yam shochu and Earl Grey tea; $8 glass, $15 half pitcher, $30 pitcher). Mindy's Hot Chocolate- NEW YEAR’S DAY PAJAMA BRUNCH — MINDY’S HOTCHOCOLATE: Sugarcoat your hangover with Chef Mindy Segal’s annual brunch. Located at the border of Bucktown and Logan Square and just steps from the Western blue line stop, Remedy will host a Studio 54 themed party on New Year's Eve featuring an all-inclusive package for $75 per person from 8 p.m. to 1 a.m. The package will include top shelf liquor, beer, wine, Red Bull, a food buffet, a champagne toast at midnight and a DJ spinning all night. For tickets, visit http://remedybarchicago.com/event/nye-remedy-studio-54am/. Starting at 1 a.m., Remedy will open to the public for the New Year's after party until 4 a.m.
Group discounts for are available for guaranteed groups of 10 or more. For more information, contact Remedy via their private events contact form at http://remedybarchicago.com/private-parties/. The Heritage (Forest Park)- Countdown to the new year at The Heritage! Enjoy an intimate celebration with a special three-course prix fixe dinner on Sunday, December 31 at the restaurant Phil Vettel of the Chicago Tribune says "raises the culinary bar" in Forest Park with its seasonal American cuisine and creative cocktails. There will be three seatings on New Year's Eve, and reservations are required. Seatings at 5/5:30pm and 7:30/8pm are $65 per person, while the 10/10:30pm seating is $75 per person and includes a midnight Champagne toast. (Price per person does not include beverages, tax and tip.) Guests can make it an extra-special night by adding a course of sturgeon caviar with accompaniments for $80 per person, and may supplement their entrees with black truffles for $20 per person. Sparkling wine and Champagne may also be ordered in advance, starting at $44 per person. The Heritage is also available for holiday parties and other private events. Please contact the restaurant for more details. Reservations may be made online at http://www.theheritageforestpark.com, or by phone at reservations@theheritagefp.com. The Heritage is located at 7403 Madison St. in Forest Park. Hilton OakBrook Hills (Westmont)- Ring in 2018 with glitz, glamour and the Rat Pack! This December 31st, the internationally-renowned Las Vegas-based show, "The Rat Pack Is Back" returns to Hilton Oak Brook Hills for their TIMELESS New Years's Eve celebration. TIMELESS reimagines the classic New Year's Eve party atmosphere with Frank and the boys in the majestic 13,000 square-foot Grand Ballroom at the Hilton Oak Brook Hills Resort. Accompanied by a 15-piece big band, "The Rat Pack is Back" will lead the jazzed-up crowed into the new year with high-spirited singing, dancing, and comedic interludes. The night will include an open premium bar, classic era cocktails, opulent food stations, party favors, a midnight balloon drop and celebratory Champagne toast. NEW this year, guests can select the location of their seats or reserved tables and VIP premier seating is located next to the stage and dance floor within an exclusive velvet rope and stanchion section. The festivities begin at 8:30PM on December 31st and tickets can be purchased at: https://timelessnyeobh.eventbrite.com. Nevin's Brewing Company (Plainfield)- Nevin’s Brewing Company, which just recently launched their new beer brand in post-Prohibition repeal style, is offering a special New Year’s dinner package for guests to taste the beer and enjoy the evening with food. For only $40 per person, this special package includes cover charge at the door, two drink tickets, food and a complimentary champagne toast at midnight! Guests may choose one appetizer, entree and dessert as part of this package. Appetizers include Firecracker Shrimp, Spinach Artichoke Dip, Warm Jumbo Pretzel, Shanghai Cauliflower. Entree Choices are as follows: Parmesan Crusted Filet Medallions served with whipped potatoes, asparagus and red wine reduction, Crab Stuffed Atlantic Salmon served with asparagus and rice pilaf and Chicken Rotolo served with a tomato coulis, pesto oil and angel hair pasta. To top off the night, guests can take their pick with a delicious dessert of Mascarpone Cheese cake with raspberry sauce, Flourless Chocolate Cake with vanilla ice cream. For more information or to make a reservation, visit www.nevinsbrewing.com. Old Town Pour House Naperville and Oak Brook- Bottleneck Management’s participating Chicagoland beer bars welcome 2018 with Brew Year’s Eve. Guests can enjoy a three-course prix fixe menu with carefully selected beer pairings for a special New Year's Eve dinner, a Champagne toast at midnight, and a video DJ playing videos along with ideal party music to usher in the new year. Patrons are invited back the next morning for a New Year’s Day recovery brunch to start the year off right, with menu items such as the Stuffed French Toast with vanilla bean ice cream battered brioche bread, Bailey's cream cheese, mixed berry compote and powdered sugar, and the Pork Benedict with smoked pork shoulder, poached eggs, and BBQ hollandaise on an English muffin with habanero hash browns and pico de gallo. Reservations encouraged for New Year’s Eve and New Year’s Day. Menu prices vary by location. Reservations for each respective restaurant can be made at the following links: Howells & Hood, Sweetwater Tavern & Grille, Old Town Pour House Oak Brook, Old Town Pour House Naperville. 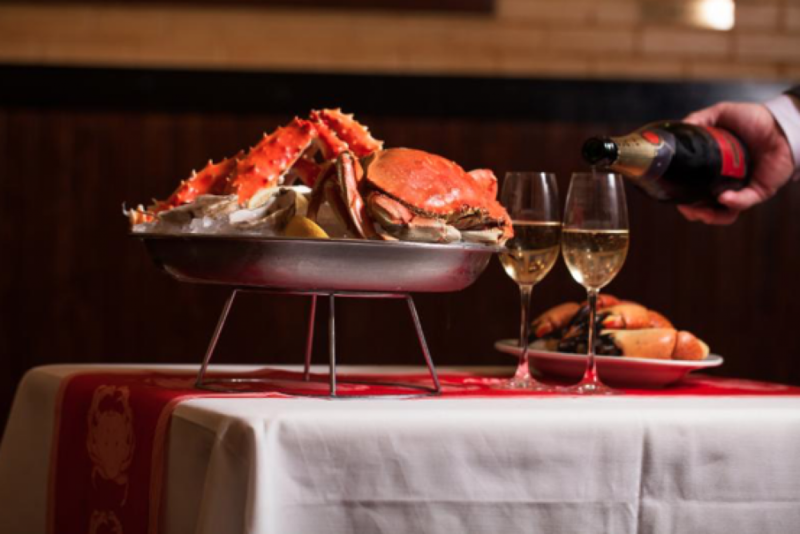 Pete Miller's Steakhouse (Naperville)- Pete Miller’s Steak and Seafood Naperville is offering a special New Year’s Eve Lobster deal for their Inaugural New Year’s Eve to usher a new tradition for the restaurant. The 1.5 pound lobster is served with a side salad and a choice of a baked potato or broccoli, all displayed and delivered on a smoking tray! Live jazz will be in-house as usual with a special performance from Return II Soul, so come celebrate with neighbors and lobster lovers alike! For more information or to make a reservation, visitwww.petemillers.com. Shaw's Crab House (Schaumburg)- This New Year's Eve 2017, head to Shaw's for brunch, featuring a complimentary mimosa or sparkling wine for all those guests of drinking age! Brunch costs $45 per person for adults (exclusive of tax & gratuity), $10 for kids 7-12, and is free for kids 6 and younger. For night owls, the Shaw's bar will be open until midnight. Stop by for a late dinner and enjoy a complimentary toast at midnight! Shaw's Crab House features two dining options - the 1940's style, traditional white tablecloth Main Dining Room and the more casual and lively Oyster Bar. This American Seafood classic offers a variety of freshly shucked oysters, made to order sushi, and more than 40 seafood dishes, including our signature Alaskan King Crab Legs. Our reputation relies on quality ingredients prepared in a straight-forward style, with crisp, professional service. For more info, call 847.517.2722, visit the website at www.shawscrabhouse.com, tweet at @shellyfromshaws, follow us on Instagram @shellyfromshaws, and keep up with us on Facebook at www.facebook.com/shawscrabhouse.com. Guests who join Tuscany in Oak Brook on New Year's Eve will enjoy live music from local band MyTime from 8 p.m. to 1 a.m. as well as dinner specials, party favors and a complimentary champagne toast at midnight. The regular menu of Italian specialties will also be available and reservations are required. Guests who ring in the New Year at Tuscany in Wheeling will enjoy a complimentary champagne toast at midnight, a special New Year's Eve Chef's Menu created by Executive Chef Bolla Loza, and live music from Rendition. The regular menu will also be available and reservations (beginning at 3 p.m.) are accepted. Celebrate the start of the New Year at Valor with the perfect menu to toast the end of 2017 and welcome 2018. Guests can now make reservations at the rustic and sophisticated North Shore restaurant for December 31st. Valor's Executive Chef, Stefan Markov (formerly of Boka Restaurant in Chicago,) is pulling out all of the stops with an $80 prix fixe menu.